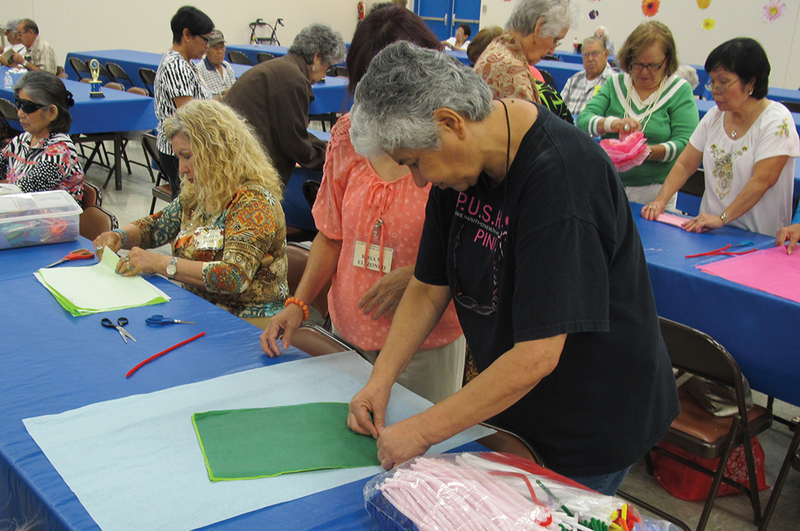 As the oldest center in the city, the Las Palmas Community Center in McAllen, Texas, has long been a recreation destination for local and visiting elderly persons. With such a rich history in senior programming, the center serves as a model for developing activities that are beneficial to a specific demographic. Is there a social benefit to the structure of the activity? Older adults and seniors have a range of physical abilities. Some may have a slower range of motion, while others may find certain activities painful. Cognitively, this age group may become bored when transitioning into retirement, or even be preoccupied with health concerns. Arts and crafts activities, for example, can be a creative outlet to lessen stress. For a Mother’s Day project in May 2014, the participants in the morning program were ushered into the dining hall where they found colorful sheets of tissue paper, multi-colored pipe cleaners, and a school box full of scissors. Seventeen ladies were there to use their creativity to make paper flowers. There was a range of ages, hearing abilities, and languages, including English, Spanish, Korean, and Japanese. I knew my directions needed to be simple and exact. I spoke in English and in Spanish. Slowly the women cut, some in a jagged line, some straight. They giggled if the cuts weren’t straight. At one table a retired 2nd-grade teacher helped her neighbor, striking up a conversation about how long it had been since she had made paper flowers as a school teacher. Hands went up as everyone was ready for the next direction. As I walked around, I noticed some participants folding the paper in on itself, like a letter, while others had made large 2-inch folds. Some redirection was needed. The women proceeded, and many who were anxious and wanted to know what happened next, came to me and asked, “When will I get my pipe cleaner?” I reminded them I would give everyone directions at the same time and that we would move on shortly. After walking up and down the aisle, I gauged that the participants were ready. Fanned, multi-colored tissue papers rose in the air. The ladies slowly pulled on the tissue paper, and while some sheets were torn and sometimes two sheets were pulled, the women laughed, talked, smiled, and told stories about making tissue flowers as school girls. Their aged hands made beautiful flowers. Remember to make the activity adaptable. 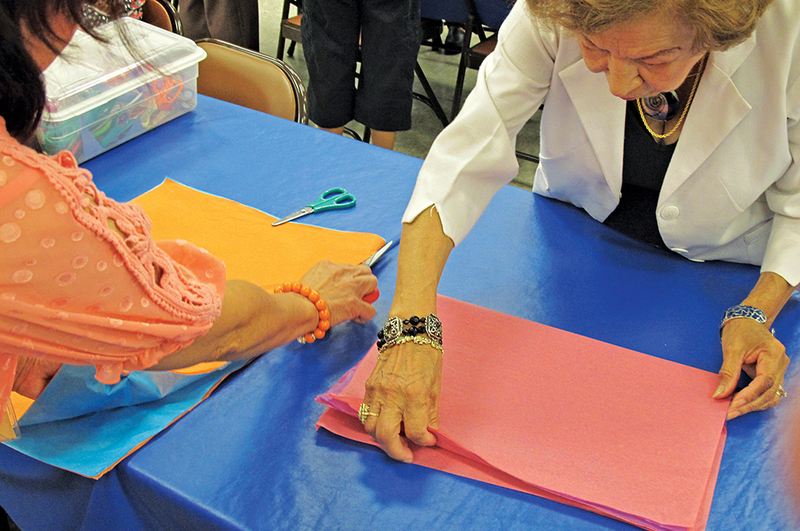 Some participants may have arthritis that makes it difficult to hold and use scissors, but they can fold paper. Have them help others who need guidance in folding. Pay attention to the participants’ cognitive abilities. Give directions that are easy to follow. Repeat if you notice confusion. Demonstrate, but still use words that challenge their listening skills, such as “right side,” “clock wise,” and “diagonal.” Give participants a chance to choose their colors and supplies so they are still in control of decisions that affirm their independence. And lastly foster an inviting social environment. Activities of nostalgia, like the paper flowers, brought many smiles to their faces, and their ability to choose their flower colors gave them something to talk about with their peers. 1. Take two sheets of tissue paper and fold in half widthwise (15 x 20); cut along the folded edge to make four sheets. 2. Fold the four sheets in half again widthwise (10 x 15); cut along the folded edge to make a total of eight sheets. 3. Begin to fold the sheets accordion style, or like a paper fan, back and forth about 1 inch (finger-width) the entire length of the paper. 4. Fold the accordion paper in half to make the mid-mark. 5. Take a pipe cleaner and fold it in half. Cross the pipe cleaner with the accordion paper at the mid-points. 6. Twist the pipe cleaner to hold the accordion paper in place, but not too tightly that the tissue paper tears. 7. Fan out the right side of the accordion tissue paper, and gently begin to pull each sheet on the right side towards you. When you are done with the right side of the paper, repeat the process on the left side. 8. The finished product will be a beautiful paper flower.